The omnipresent developing world traffic of Nairobi, Kenya can’t stop expats from flocking to The Talisman, an eclectic, cozy gastropub for international culinary fusion or cocktails with friends. I joined that set for a night during my trip to Kenya, and the restaurant didn’t disappoint for food and atmosphere. For those of you who haven’t visited sub-Saharan Africa, I’m guessing the image in your head is taken from The Lion King or, perhaps, nature documentaries: a grassy savannah with a sparse few stubby trees. 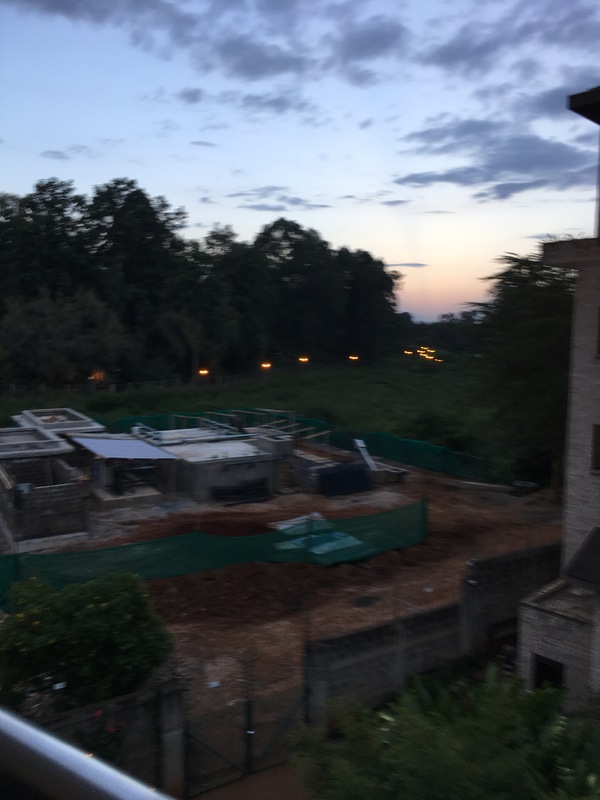 Yes, Africa does have them, of course, but the city of Nairobi is certainly more green, hilly, and forested than one might expect. Or that just might be me. With the exception of downtown Nairobi with its skyscrapers, or its densely populated urban slums with human life beating out the plant kingdom (sometimes barely a victory), the city and its surrounding area is forested, not unlike a somewhat more tropical version of those seen in the US and Europe. The effect is that you can’t really see just how terrible the traffic is ahead of you, and you find places that are almost magical surprises in their existence within the forest. The Talisman is one such surprise – and it should be, given that it is not the most easily accessible with a location on the opposite side of the city as its primary business and diplomatic districts. On a map, it doesn’t look quite so far. The distance is less than 6 miles (10 km) from the city center, but in Nairobi terms, its more like 60. Traffic in Nairobi is absolutely horrendous, and that means something, coming from someone who commuted in Lima, Peru and has experienced the world-class horror that is trying to drive through crowded Agra, India on a night particularly auspicious for weddings (which stop traffic completely). Nairobi’s baffling affinity for roundabouts, strobing road cameras, and U-turns in place of organized traffic control (signals or humans) is perhaps its own worst enemy. Bottom line, you must be very accustomed to the traffic and/or have a very good reason to drive across or around the city for dinner at The Talisman. 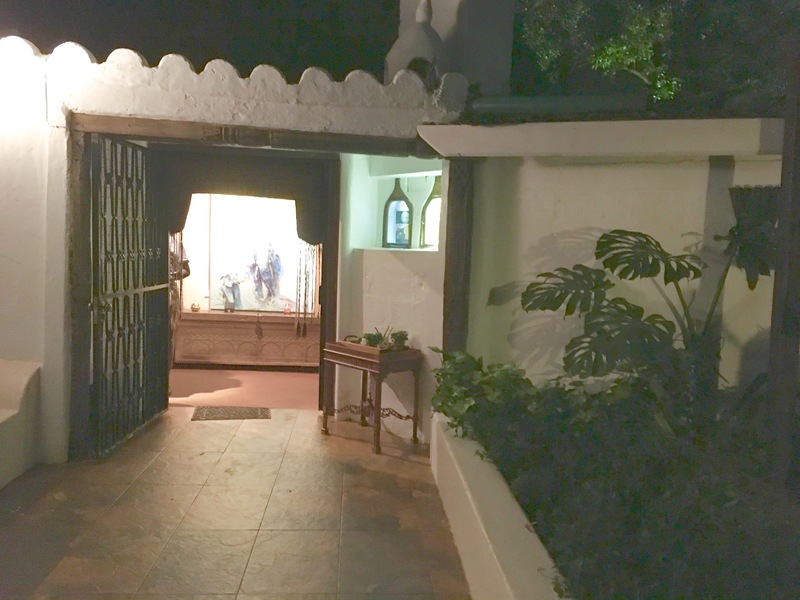 The Talisman itself is rather unassuming from its driveway, a rambling, one-story white stucco building that appears to be a converted residence, surrounded by tall trees. Inside, a network of rooms with working fireplaces and walls adorned with local art – impressionist landscapes and portraits – form separate dining areas, and its wooden bar evokes nothing of the gastropub marketed on its slick website. But its coziness grew on me, a respite from the traffic, from the crowded slums and bumpy dirt roads I passed through earlier in the day. I realize that probably sounds a little shallow, but it’s really all about unwinding after a day of overstimulation and too much jostling in a van. My colleague and I were seated in their covered outdoor patio – the covering fortunate after a wet afternoon during this winter rainy season. A charcoal grill whimsically in the shape of a grinning frog (the mouth full of coals) kept us warm as the evening darkened. It was perhaps a bit too dark without a candle, but that addition made our meal feel a bit more rustic – never mind that anything but African cuisine is part of the menu. Having skipped lunch, I was the hungriest I’d been on my trip to Kenya, and my colleague had a bit of a scare owning to playing prawn roulette at dinner the preceding night, so we both chose starters: me a beetroot and goat cheese tartlet and him that African staple, spicy chicken wings (sarcasm). 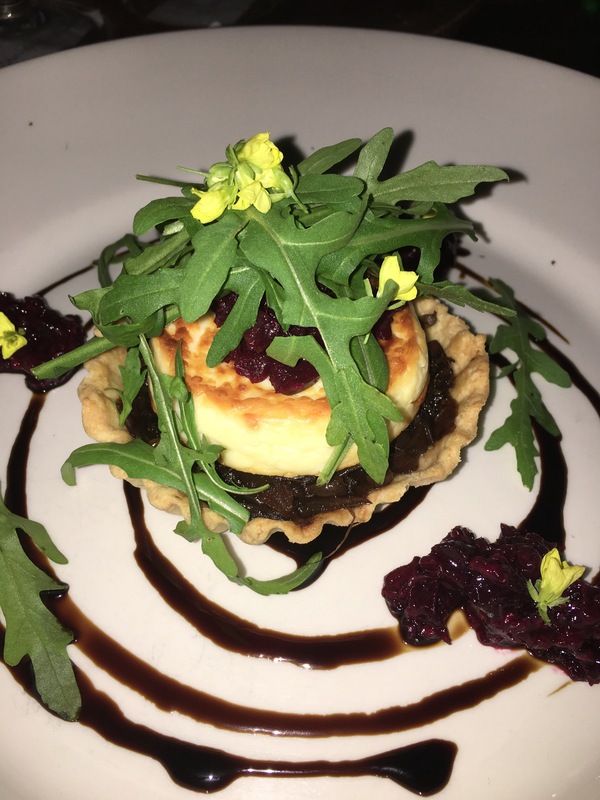 The tart was layered, with caramelized beets and onions lining the shell and crowned with goat cheese. 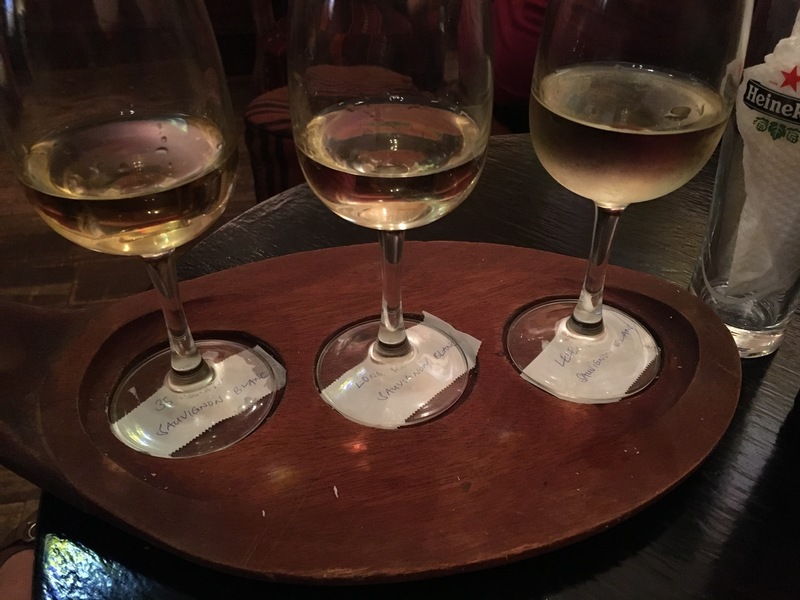 Excited to see wine flights on the beverage list (which I discovered to be an alien concept to the British, apparently), I decided to be adventurous and try a Sauvignon blanc flight that included variants of the varietal from Chile, South Africa, and Kenya. The Kenyan wine had an intriguing aroma of toasted marshmallows. I should have guessed right there what that meant, but I eagerly took a sip. The wine had a cloying white-grape juice flavor, which was masked by a smokiness best described as tasting like the grapes were grown in a field surrounding by heaps of burning trash (a real and not abnormal odor around Nairobi and the Rift Valley). Oh well! I now know not to drink Kenyan wine anytime soon. Rift Valley Wine: When you miss that toasty, garbage ash aroma. 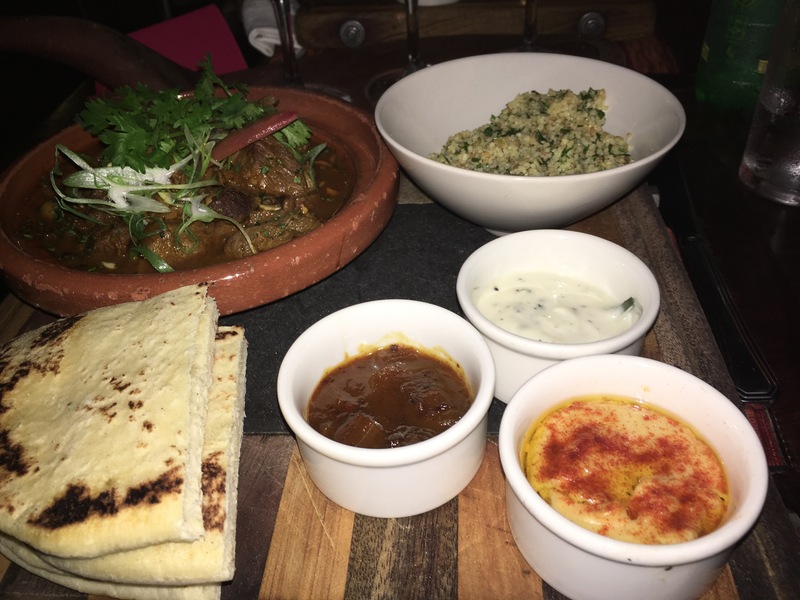 For my main dish, I chose a Moroccan spiced beef stew, served with a minted couscous that looked like tabbouleh but was certainly couscous; soft pita; yogurt, chutney, and hummus. The hummus tasted subtly and weirdly of bananas – I am going to guess that was all me. Who makes banana hummus? It was a fun palette of sweet, salty, tangy, and earthy flavors at once. It was satisfying and filling to my empty stomach. My colleague ordered steak, which came with “matched potatoes”. No, I don’t believe that was a typographical error on the menu. These were little fried potato cakes that made French fries seem pedestrian. If I return to the Talisman, I definitely would order those potatoes as a side dish. If our beef-heavy meals weren’t enough, chocolate desserts were our downfall. 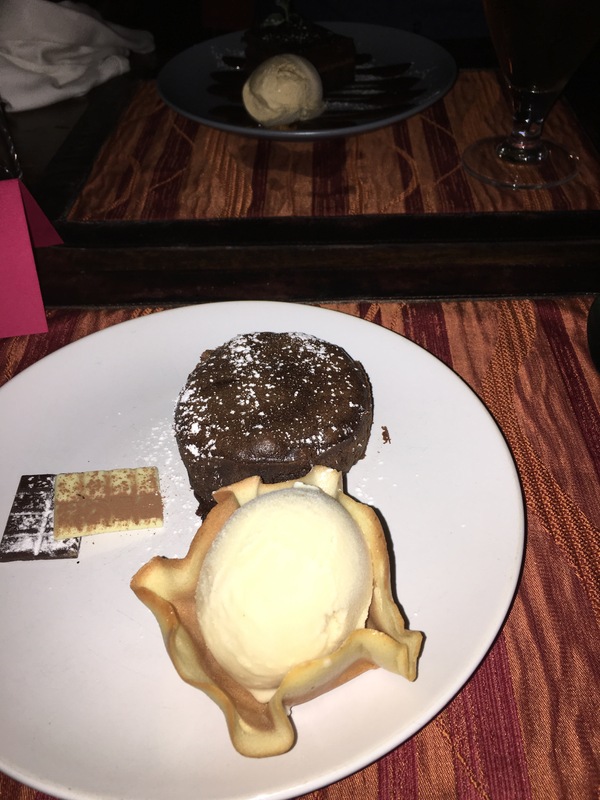 We split a chocolate fondant (molten cake) and a seasonal special – a Bailey’s brownie, both served with ice cream; both were fantastic, but the brownie was other-worldly with the clear flavor of Irish cream infused throughout. I need no other words to describe the sensation other than YUM. Stuffed, satisfied, and relaxed after a day of overstimulation, The Talisman was the perfect culinary antidote we needed.